The cool wave of air-conditioning that hits you as you descend into a subway is a familiar one to the seasoned traveller. As is the monotonous whoosh of the access gates as commuters pass through, and all the other sounds that accompany a busy underground. I have found that even the people are the same, involved in their own spheres of activity as they chat, tap away on their mobile phones or gaze on idly as their earphones provide life’s soundtrack. 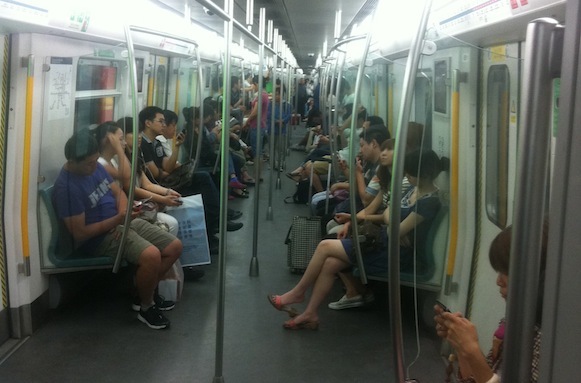 These are things we hardly think about in many of our everyday situations, but I began thinking about them today because this particular subway happened to be in the heart of Beijing. The stereotypical Western viewpoint of China often presents the red giant as the epitome of cultural contrast to the societies of the West. I would argue that this is not entirely untrue. Since upon arriving in the mainland I haven’t heard a word of English save the odd “hello”, The rumours of the extravagant and strange delicacies are also not too far off the mark, and the noticeable lack of any Latin alphabet with which to try and order my lunch is one of many aspects of Chinese culture that supplements the “culture shock”. Yet the similarities between this society and those of the Western world are too striking to ignore. Moreover these are not merely similarities but shared cultural and societal practices. Being the observer in China has provided me with one of the most informative and obvious examples of the socio-spill that is constantly occurring around the globe. Expecting to find an abundance of bicycles, a billion people and clusters of ancient temples, I was met with a Starbucks coffee shop, an Apple retail store and an Audi dealership – the bicycles, people and temples were scattered amongst these. Everywhere I looked there were traces of global influence – subtle or blatant – ranging from the architectural to the more abstract. Let me paint you a brief picture to illustrate the extent to which this cross-cultural influence exists in the communist giant that is China: after taking a New York style yellow cab to a popular nightlife district, we chose a small bustling bar to have a drink at. The bar was called The Blue Lotus (from the Belgian born classic Tintin comic) and we sat down to drink a Dutch Heineken. A small band was playing using American instruments and singing British pop songs and all this while not a soul around us could speak a word of English. The heavy Western influence in every corner of society is another aspect of Chinese culture that has been very interesting to observe. Although historical sites such as the Great Wall of China and the Forbidden City have been meticulously preserved, how will the contemporary Chinese identity fair against the imposing Western influence? In a globalising world, what will distinguish one culture from another, or are we all destined to transform into a global culture driven by brands and lifestyle rather than heritage and history? Is language one of the last frontiers of individual culture? There is a noticeable lack of negativity in China. The Chinese people come across as content (every person we spoke to felt that life will keep improving and the current status quo is adequate to maintain their happiness – in a nutshell), everyone is busy with something. The place is clean (except for the bathrooms :). By clean I mean that parks are maintained, streets are constantly swept and there is very little litter anywhere. What does it mean to have such a well-functioning society (from the outside) existing in a sphere of political restrictions and lack of personal freedom? In the context of the current political crises in North Africa and the Middle East, it seems unlikely that the Chinese society will attempt to lean in the direction of political reform. How does this affect our understanding of the concept of liberal democratic freedom as a prerequisite for an effective developing society?